Whether you are a professional in the print and marketing industry or an amateur photographer, your project has to look its best. 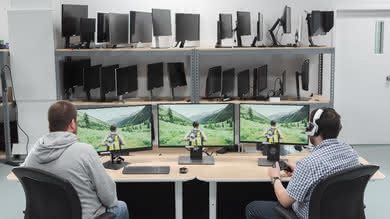 The first step is to have a good monitor with accurate colors. There is nothing worse than printing your project only to find the colors are off because your monitor couldn't display them properly. 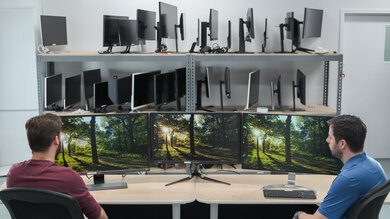 We've tested 64 monitors so far, and below are our picks for the best monitors for photo editing, graphic design, or media creation available for purchase in 2019. 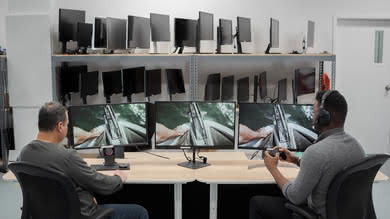 See also our recommendations for the best 4k monitors, the best ultrawide monitors, and the best monitors overall. 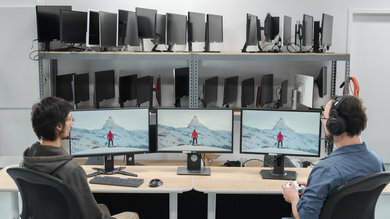 The LG 27UK650 is the best monitor for video editing, photo editing, and graphic design that we have tested so far. 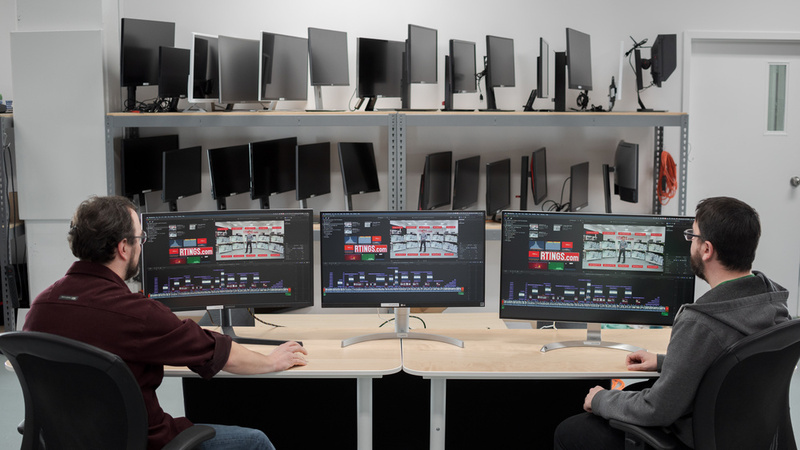 The 27" screen and 4k resolution allow you to see more of your project at once. 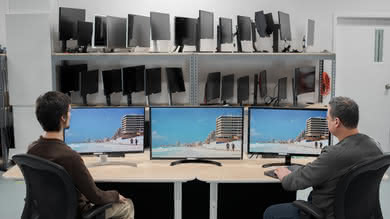 It also has wide viewing angles, great for sharing your work with multiple people. It has great color reproduction. It displays gradients almost perfectly with almost no banding, and it has an excellent SDR color gamut. Unfortunately, although the 27UK650 supports HDR, it can't display a wide color gamut and it has no local dimming feature. It also has limited coverage of the Adobe RGB color space, which is less than ideal for professional photo and video editing. 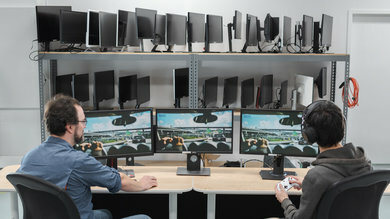 Overall, though, the 27UK650 is a great monitor that should please most people. 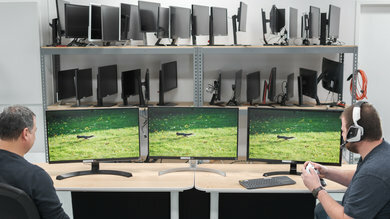 If you would prefer a larger monitor than the 27" LG 27UK650, check out the LG 32UD99 instead. 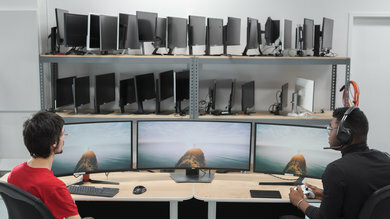 The larger 32" screen makes it easier to see more of your work at once, but other than that, these two monitors perform very similarly. 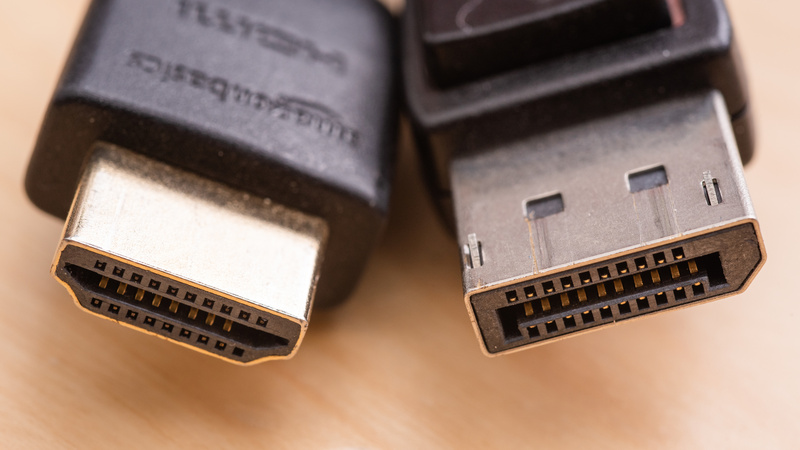 The 32UD99 has a few nice convenience features, including a built-in USB hub and USB-C port. 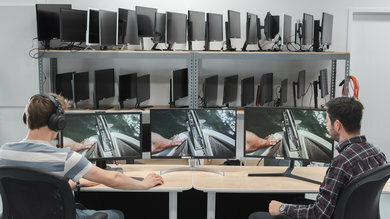 This is especially convenient for MacBook owners, as you can charge your computer while displaying the image on the screen, using only one cable. You can also use the USB ports to connect a drawing tablet or trackball. If you need the most accurate colors for professional photo and video editing, check out the Acer Predator X27. 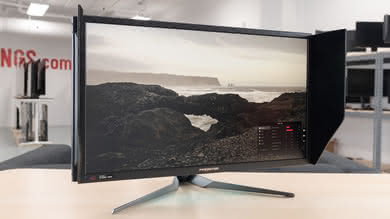 The X27 is an impressive 27" monitor that delivers good overall picture quality, with wide viewing angles and excellent peak brightness in HDR. It also has two blinders on each side to help reduce glare. The X27 is the best choice if you work with the Adobe RGB color space, as it has nearly perfect coverage of the entire Adobe RGB gamut. 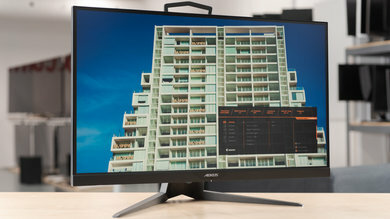 If you also work with HDR content, the X27 won't disappoint, as it has the widest HDR color gamut of any 2018 display we've tested with nearly perfect gradient handling. Unfortunately, despite the local dimming feature, the X27 doesn't look as good in a dark room, as it has bad black uniformity and a mediocre contrast ratio. 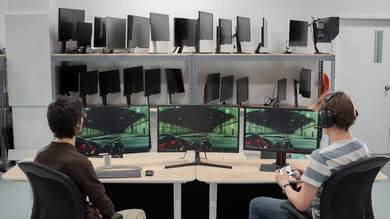 Overall, though, the Acer Predator X27 is a great monitor for most people and a very good choice for media creation. 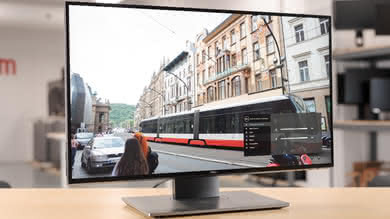 If you would prefer a widescreen monitor for easier multitasking when editing photos, check out the Dell Alienware AW3418DW. 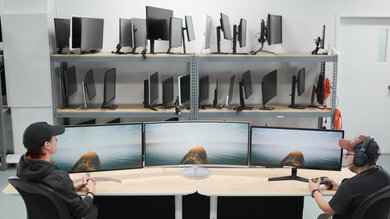 The 34" screen, with a 3440x1440 resolution and 21:9 aspect ratio, is perfect for multitasking or for editing a large workflow. It has nearly perfect coverage of the sRGB color space and excellent color volume, but unfortunately, it doesn't cover the wider Adobe RGB color space as well. There is some noticeable banding when working with gradients. Normally, this wouldn't be an issue, but if you frequently work with gradients it might be. 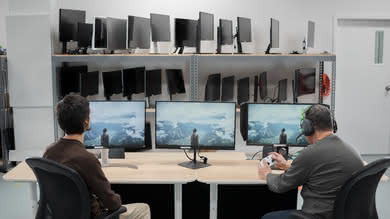 It also doesn't perform very well in a dark room, due to the limited contrast ratio and poor black uniformity. 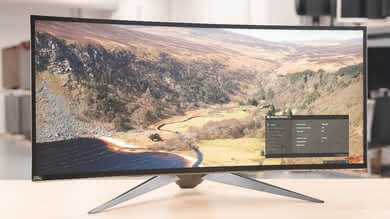 The Dell AW3418DW has a great design, with a futuristic look and a unique stand. 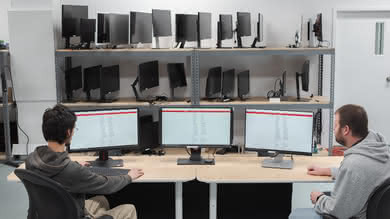 The stand itself isn't as good as most Dell monitors, but can still be easily adjusted to an optimal position. 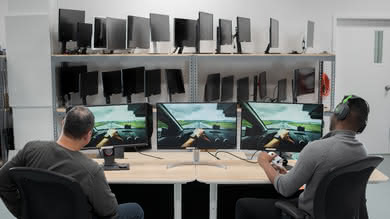 Overall, it is a very good monitor that should please most people. 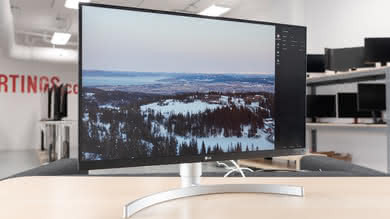 If you are looking for a less expensive option, the best monitor for photo editing, graphic design, or media creation in the budget category is the Dell U2518D. 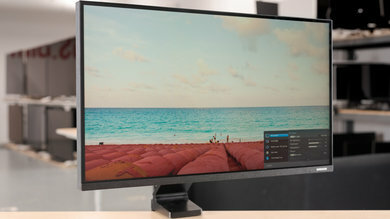 It is a good 25-inch IPS monitor that delivers good picture quality, wide viewing angles, excellent sRGB coverage, and can display nearly perfect colors with minimal banding in gradients. 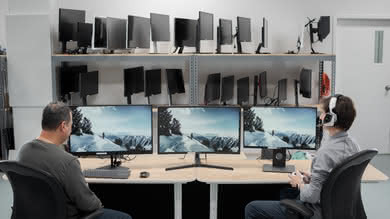 Unfortunately, dark room performance is not good. Just like most IPS monitors, blacks look gray in a dark room and black uniformity is disappointing with a lot of noticeable backlight bleed. 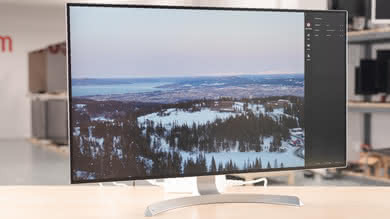 The Dell U2518D can display HDR content, but not with satisfactory results as it doesn't have a wide color gamut. 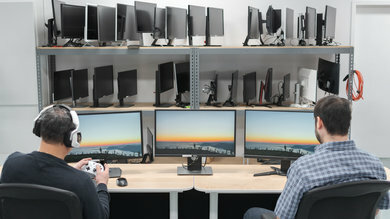 Its HDR color volume is disappointing. It also has limited coverage of the Adobe RGB color space and might not be the best option if you are a professional in the print or media industry where the need for such color space coverage is more apparent. 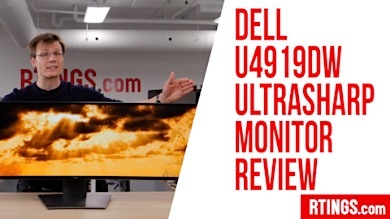 Overall, the Dell U2518D is a good monitor that delivers great value within its price range. 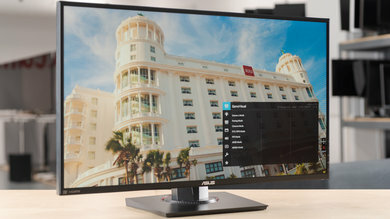 Our recommendations are based on what we think are the best monitors for graphic design, photo editing, and media creation currently available. They are adapted to be valid for most people in each price range. Rating is based on our review, factoring in price and feedback from our visitors.